France is set to launch studies on the replacement of the sole aircraft carrier of the French Navy (Marine Nationale). The Charles de Gaulle will be decommissioned by 2040, according to the 2019-2025 military planning law which will be presented tomorrow in the ministerial council. Naval Group (Formerly DCNS) Evolved Aircraft Carrier (DEAC). This design could serve as a base for the (yet to be started) Charles de Gaulle aircraft carrier replacement programme. This design is also being offered to India. 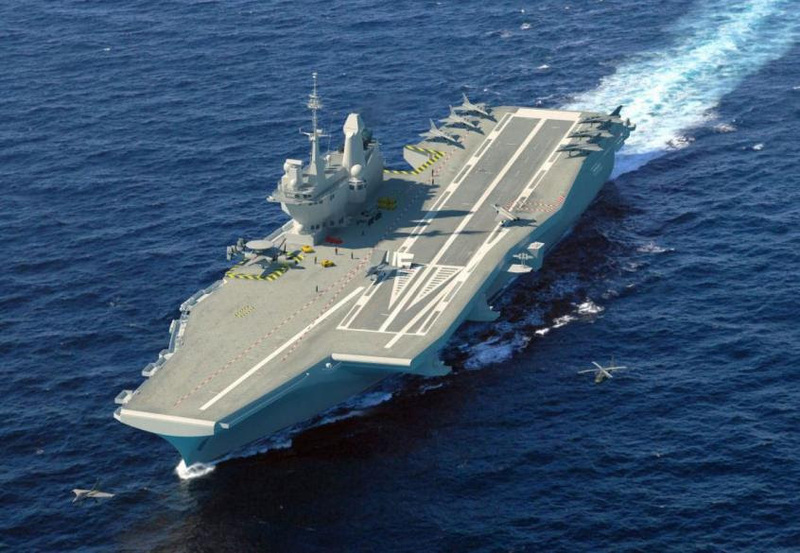 "We reserve the possibility of having an aircraft carrier at the same time as the Charles de Gaulle or after" a source close to the Minister of Armed Forces Florence Parly told AFP. According to AFP, France plans to allocate 295 billion euros to its military between 2019 and 2025, with the objective of increasing defense spending to 2% of GDP in 2025, according to the draft military programming law to be presented tomorrow in the ministerial council.The French defense budget, of 34.2 billion euros in 2018, will benefit of a 1.7 billion euros increase per year until 2022, followed by increments of 3 billion per year from of 2023, after the next presidential election, according to the future military planning law. Navy Recognition understands that both the French Navy and Naval Group (formerly DCNS) were hopefull for new aircraft carrier studies to be funded as early as possible because there is a very slim window of opportunity: If studies were/are funded between the end of 2017 and the end of 2018, there is a chance for the potential "Charles de Gaulle replacement" to be ready in time for the next refit of Charles de Gaulle. France's sole aircraft carrier is currently undergoing its mid-life refit. Refits are scheduled every 7 years on average. For comparison, the Royal Navy's HMS Queen Elizabeth first steel cut took place in July 2009, she was launched in July 2014 and started sea trials in June 2017. As we reported several times in the past, France's future aircraft carrier (if funded and built) will feature EMALS by General Atomics. Discussions between DGA, the French Navy, Naval Group and General Atomics have been taking place for a while now and are still ongoing. The French Navy was even briefed by NAVAIR on both EMALS and AAG at the test facility in Lakehurst last summer. More recently, during the SNA 2018 tradeshow held in Washington D.C. in January, Navy Recognition learned that the French Navy has been briefed on E-2D Advanced Hawkeye by Northrop Grumman. We contacted a French Navy PAO who confirmed to us that procurement of E-2Ds is being considered as part of the 2019-2025 military planning law. The French Navy Naval Aviation currently deploys three E-2C Hawkeyes acquired in 1998, 1999 and 2004. Hallo Gast! De reacties in topics zijn verborgen voor gasten. Je mist op dit moment 41 reacties. Registreer jezelf of login om de reacties te bekijken. Pagina opgebouwd in 0.061 seconden met 26 queries.